Andrew's "official" last day of work was last week or maybe it is this week… regardless, we don't know what we are doing/where we are going yet. And not a day goes by where someone doesn't ask us what we are doing next. If you have asked us, don't worry, it does not bother us:), in fact it seems that God is using you to teach us a lot right now. I think people look at our situation and generally have a reaction of, "Wow (and not in a good way…)! I could never do that, just not know what is going to happen next." But the reality is that *none* of us know what is going to happen next. This earth is plagued with sickness, job loss, loneliness, death, etc. Every person's life situation on earth is unstable, ours is just a little more obviously unstable right now. This unstably in the world brings us to faith. We all have faith in something. Whether it be faith in our job, our college education, our health, etc, but all these areas of faith can and eventually will let us down. And then if you continue reading Hebrews 11 you are brought through the "Faith Hall of Fame." Person after person in circumstances and situations that were hard and/or did not make sense, yet they had faith in God. Really it is pretty amazing, you should take a minute and read Hebrews 11 now:)! So, no, we don't know what tomorrow will bring, but we never really do. 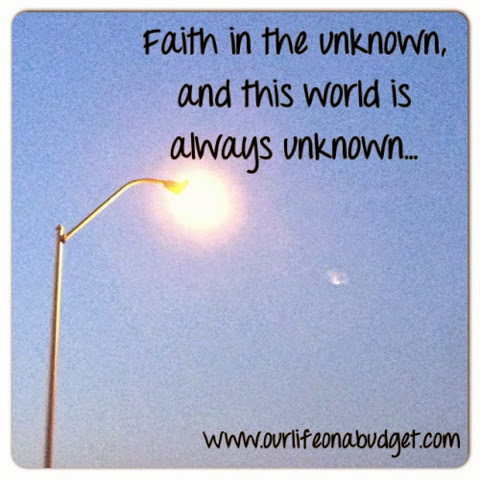 We are clinging to the faith in the confidence of the things we have hoped for and the assurance of the things unseen. We are clinging to the fact that this earth is not our home and that Jesus is preparing a place for us, a better country, a heavenly one. We are are clinging to the fact that together with Christ, in glory, we will be made perfect one day. Lord, let us have this kind of faith today, whether things feel stable or not. I have loved this song since I heard it! May God bless you as He leads you where He would have you to be. Your feet may fail you but He never will! Blessings! Thanks so much! That is such an encouragement in our lives! This is so true, Stasia. We know exactly what you two are going through and experiencing. We've been there...and like you said...we all are there--not knowing what will happen next. It's a great place to rely completely on Him and place complete faith in Him. I agree Leslie… it is kind of funny because I feel like everyone else is freaking out, and I am really finding peace in Christ! Thank you for your wise, wise words.